I love this photo of my friend Renee being spanked by Arch Rival Rollergirl Kirsten O’Loughlin at the 2012 Midwest Mayhem in the City Museum here in St. Louis. I originally posted this image on Facebook but then kept going back to it. I developed a black and white version from the original color which I think adds a gritty element to it which I really like. It was shot in low light with my X100 and the resulting grain also adds to the mood. I just love this photo. I Won’t … I Won’t … I Won’t … Love. I’ve been utilizing my iPhone more and more these days for my “always with me camera”. Here are some of the images I shot over the weekend running around town with a borrowed poodle and some house-guests. 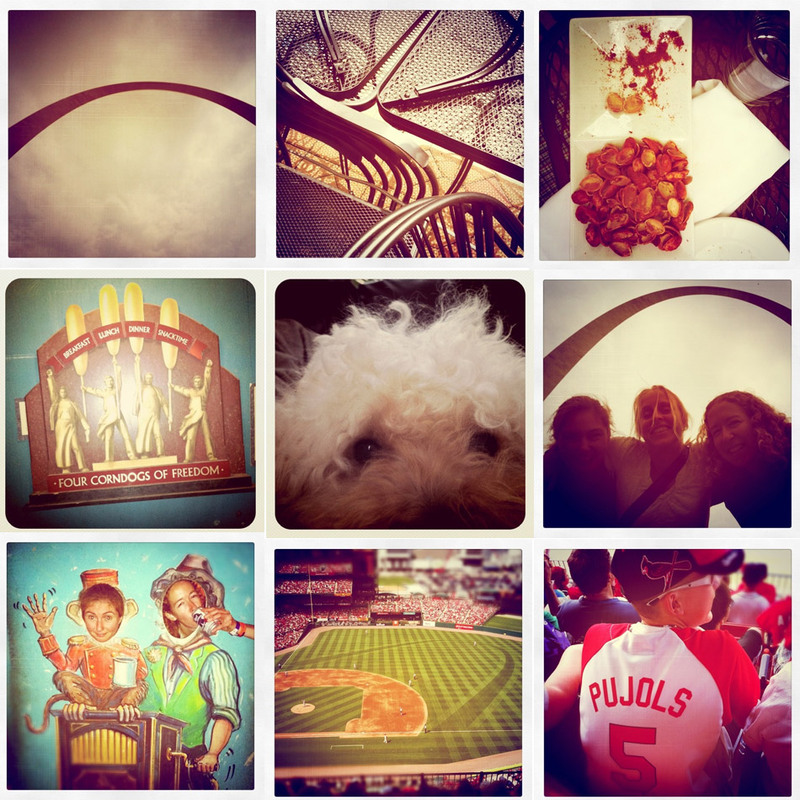 It has been a busy week here in St. Louis, and it’s only Wednesday. I had to actually pull up my calendar to check that, since to be honest I wasn’t exactly sure what day of the week it is. We have been busy unpacking and car buying, and while we are getting to the end of the unpacking process, we still have a lot to do. Not surprisingly I’m settling into the new loft very well. I have a kitchen I can use, you know, ordinary sized stove not a little toy stove, counter space … all in all it’s amazing. It’s so amazing in fact, that I have to make sure to remember that my job is not to hang out in my office apartment every day. I am a photographer, and a photographer that spends his days organizing hanging files in his filing cabinet and other household items is not going to improve as a photographer no matter how diligently he stacks and straightens his Post-Its, pens and copy paper. Having a neat and organized office and having all of your equipment in order is important, no doubt. But it all means nothing if you’re not shooting. Hence the acronym that most photographers who blog have mentioned: ABS, or Always Be Shooting. It’s sometimes difficult to find the time when you have the other important things in your life happening, but if you’re a professional photographer, this is something you need to be doing. Not only so that you can have work to throw up on your blog, but so that you keep your creativity primed, your skills sharp. And lets be honest here, if you love it, you’ll find the time. Given that I’ve been in Saint Louis for exactly one week as of today, I have a ton of stuff to do. But today I took some time for myself and went out with my camera to explore a bit. I didn’t make a massive trip of it, and I stayed in the neighborhood where I live. However, my little photo walk this afternoon got the juices flowing, and as a side benefit, opened my eyes to a bit more of the city then I’d seen before. I can’t wait to go further afield (although when I go I’ll be armed with water, a hat, and sunblock – the St. Louis humidity is a force to be reckoned with. It was kind of overcast in patches today when I was out, and I felt that black and white conveyed the mood. Here is some work from today. As a side note, Saint Louis has alleys. There is nothing more interesting to me than these little half streets behind buildings, in the middle of blocks. They aren’t on every block, but for some reason they always make me smile when I stumble across them. I had alleys growing up in PA, but New York doesn’t really do alleys – too much wasted real estate I guess. Perhaps I should do a project of just alleys. I’m also thinking of doing a project about parking garages … lots of those in Saint Louis too!